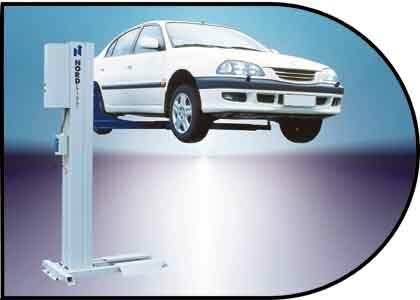 L & C Garage Equipment are importers of these excellent and versatile lifts. This is the DH2500 with a lifting capacity of 2,500Kg and can raise a vehicle of that weight to over 2 metres in less than 30 seconds. Note the distance between the vehicle and the lift post, plenty of room for access all around the car, even open the drivers door. This single post lift is available in several lifting capacity variations, on all versions the adjustable arms allow for individual jacking at manufacturers specified points yet are long enough for free access and jacking of vans and transporters. For the safety of you and your staff -this electro-hydraulic lift is fitted with a Mechanical safety lock, a Relief valve against overloading and Automatic arm locking devices. A mobile variation of this single post lift is also available as DHM-2500 & DRM-2500 with a lifting capacity of 2000 kg. The Nordlift Mobile Single Post Lift is a versatile and cost effective way of servicing cars and vans. The lift is easily moved around the workshop on it's own 3 wheels to where it is convenient to work on the vehicle and is perfect for most repair jobs : brakes, exhaust replacement, service and body repair. Each column is an independent lift with it's own cylinder, electrical lock valve, flow control valve and hydraulic unit and a connection to a common logic control program. Full safety features, ie any interuption to power or any cable between columns or if too great a height difference detected : then all columns stop and remain in position. Emergency Stop button on each column, if touched stops all columns. 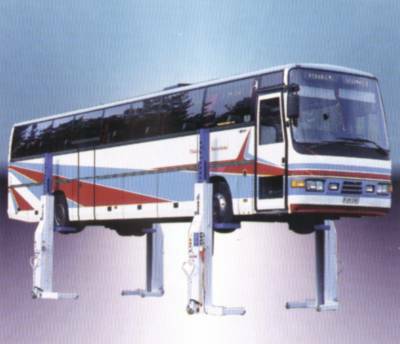 Moving the columns into position is easy using the handle attached to the steerable wheel at the back of each column - as the column takes a vehicle load this wheel retracts and the column itself rests upon the floor. A range of accessories are available such as axle stands, chassis cross beam (1500 kg capacity), driving platforms and adapters for small wheels.